In the Account Module, select procedure(s) to allocate unearned income to. In the Payment dropdown, click Allocate Unearned. Or, do not select procedures and click the Payment dropdown, Allocate Unearned. All completed procedures that are not yet paid off will list. Unearned / Prepayment, can be quickly allocated to completed procedures. This method is useful when you only have one unearned type. Highlight the procedure(s) to attach to the payment, then click OK. The Payment window will open. The payment type will equal None (indicating this is a transfer of income only). 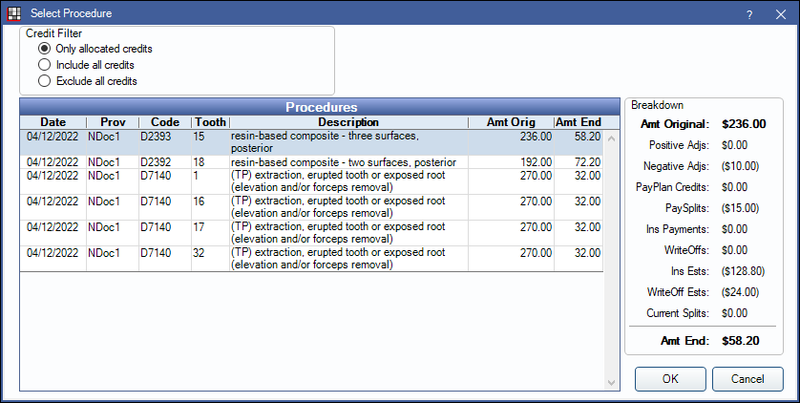 Paysplits for the selected procedures and unallocated amount will be auto-created, offsetting each other to equal 0. Each paysplit will be linked to the original unallocated payment for reporting purposes. Verify that paysplits are accurate. Note: If the paysplits being created exceed the available amount of unearned income on the account, a pop up warning will display. Decline to correct the amounts entered. If you have more than one unearned income type (e.g. overpayment, copay, etc), use this method to manually allocate a specific type to a procedure. To allocate a specific unearned income type, click Payment and enter a $0 payment. In the Payment window, check Payment Type, None (indicates a transfer of income). Create two paysplits to subtract the amount from the unearned income type and add the amount to the procedure. First, subtract the amount from the unearned income type: Click Add Split, enter a negative amount, and select the Clinic. Under Payment Split, click Attach to select the unallocated paysplit. The Unearned Type and Provider will automatically change to that of the original prepayment. Click OK to go back to the payment window. Repeat for each unearned income type. 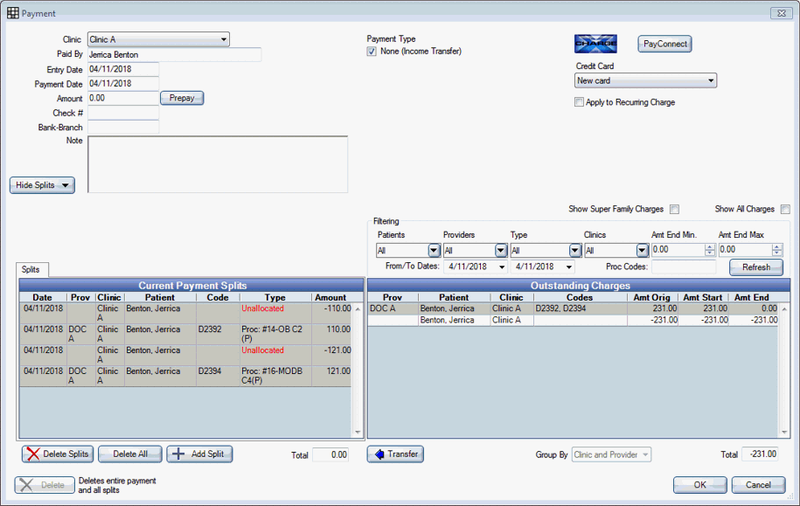 Then add the income to a procedure: Click Add Split, enter a positive amount, leave Unearned Income Type as None, select the Clinic and Provider to transfer the income to. Under Procedure, click Attach to select a procedure. Under Payment Split, click Attach to select the prepayment used above to link to this procedure. Click OK to go back to the payment window. Repeat for each procedure. Verify the Total splits equal $0. If they do not, review the paysplits. Both the total amount of the income transfer and paysplits should equal $0. Once unearned income has been allocated, you can quickly view the allocations via the original prepayment. If the unearned income is allocated to the wrong clinic, patient, procedure, and/or provider, edit the original allocation (if done same day) or do an Income Transfer to reallocate the income (if the allocation was done in the past). Double click the original prepayment. On the Payment window, click the Allocated tab in the Current Payment Splits grid. For each allocation, enter the date, amount and patient list.